The parish was in the North East sub-district of the Lincoln Registration District. The North Lincolnshire Library holds a copy of the parish census returns for 1841 and 1881. The Anglican Church is dedicated to Saint Oswald. The existing church building dates from the 14th century. It contains monuments to the knightly families of Fulnetby and Harrington. There are indications that a church existed here by 1241, and probably earlier. The existing building is thought to be at least the third church built at Rand. The church seats about 120. In ancient times, Fulnetby had a chapel of ease for locals and was the seat of a knightly family of the same name. 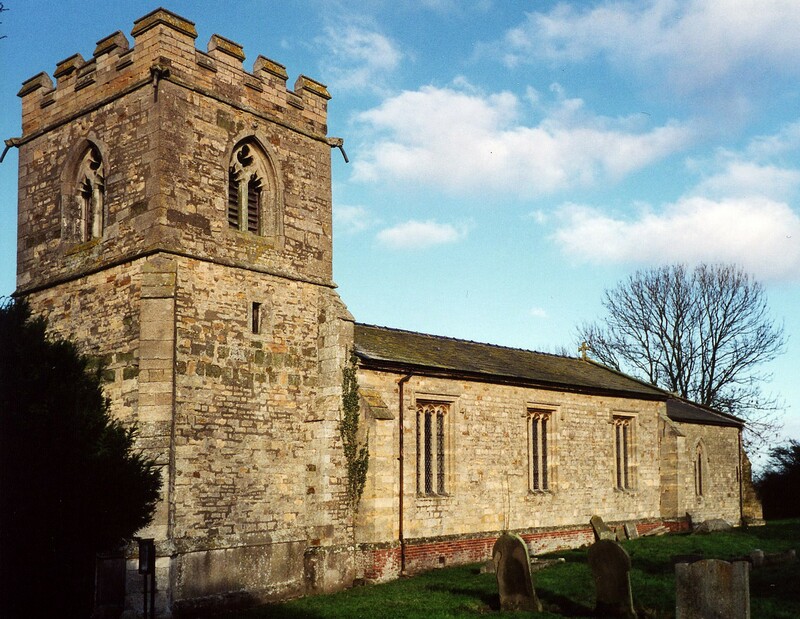 A photograph of St. Oswald's Church is at the Wendy PARKINSON English Church Photographs site. Here is a photo of Saint Oswald's Church, taken by Ron COLE (who retains the copyrights). Parish register entries start in 1661 and include Fulnetby, but Bishop's transcripts appear to go back to 1562. Parish registers are on file at the Society of Genealogists, covering marriages 1754 - 1837. Check our Civil Registration page for sources and background on Civil Registration beginning in July, 1837. Rand is both a village (officially a "township") and a parish about 9 miles north-east of Lincoln and 2 miles west of Wragby. Wragby parish lies to the east, Holton parish to the north and Goltho parish to the south. The parish covered about 2,100 acres in 1913, much more land than allocated under the 1841 boundaries which included only 1,010 acres. The parish includes the hamlet of Fulnetby (or "Fulnery" in some old records), about a mile north-west of Rand township. Take the A158 west out of Wragby and turn north after about two miles. The village is about a half mile off the trunk road. The village of Fulnetby is on the B1399, just a mile off the A158. In 1842, the chief landowners were Mrs. Amelia BARKER, lady of the manor, Robert CRACROFT, lord of the manor of Fulnetby, Earl BROWNLOW, Capt. CALDECOT, C. HATCHETT and other families. In 1872, the chief landowners were Mrs. Amelia BARKER, lady of the manor, Lieut.-Col. W. CRACROFT-AMCOTTS, C. H. CUST, the CALDECOT and other families. In 1882, the chief landowners were Mrs. Amelia BARKER, lady of the manor, Lieut.-Col. W. CRACROFT-AMCOTTS, C. H. CUST and Joseph PHILLIPSON. In 1900, the chief landowners were the Rev. Richard BURDEN and the Rev. R. S. HUTCHINGS and several smaller owners. In 1913, the chief landowners were the Rev. Richard BURDEN and the trustees of Rev. Canon R. S. HUTCHINGS and several smaller owners. The national grid reference is TF 1078. You'll want an Ordnance Survey Explorer #272 map, which has a scale of 2.5 inches to the mile. The name derives from the Old English Rand, meaning "(place at) the border or edge". It appeared in the 1086 Domesday Book as Rande. Fulnetby (or "Fulnery" in some old records) derives from Old Scandinavian full+nautr+by, meaning "village of one who has a full share". It appeared in the 1086 Domesday Book as Fulnedebi. White's 1842 Directory lists the following surnames in the parish: BENTLEY, BLOW, GLASIER, GLOVER, JACKSON, MACHON, NEWHAM, ROWBOTHAM, WARD and WILSON. White's 1872 Directory lists the following surnames in the parish: BREWER, LLOYD, MACHON, PEEL, SETTERINGTON, WARD and WILSON. White's 1882 Directory lists the following surnames in the parish: BARR, BREWER, BURTON, GILLIATT, KIRK, LLOYD, MACHON, MUSGRAVE, PHILLIPSON and WARD. Kelly's 1900 Directory lists the following surnames in the parish: ALLIS, HARRISON, KNAPP, LAMING, MUSGRAVE, PAULGER, PHILLIPSON, SPAIN and WARD. Kelly's 1913 Directory lists the following surnames in the parish: ALLIS, BOWSER, CATLING, KNAPP, LAMING, MOTSON, OSBORNE, SAXELBY and WHITEFOORD. In March, 1887, the "Rand Wood" 1,340 acre portion of this parish was transfered to Fulnetby Civil Parish. The children of Rand attend school at Wragby. The children of Fulnetby attend schools at Langworth or at Holton.